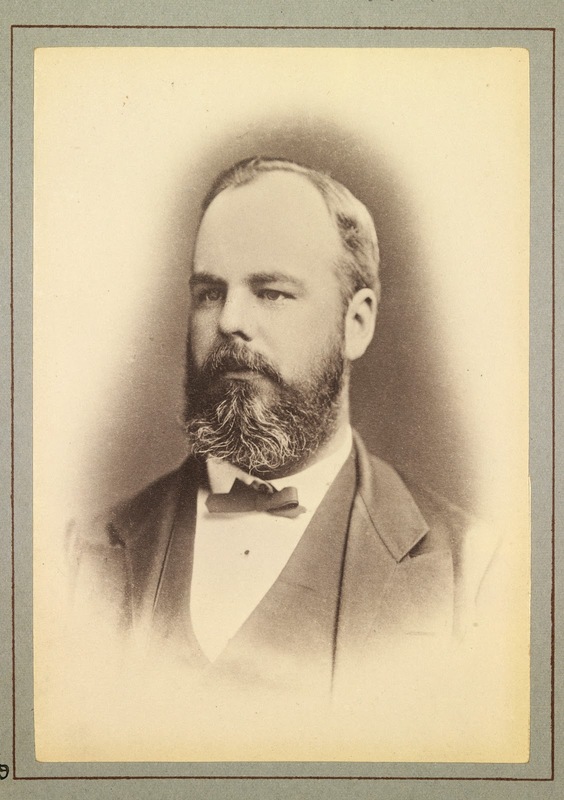 Mr. Thomas Nevin, photographer, has been appointed Town Hall keeper, Hobart Town, in succession to the late Mr. Needham. There were 24 applicants for the office. 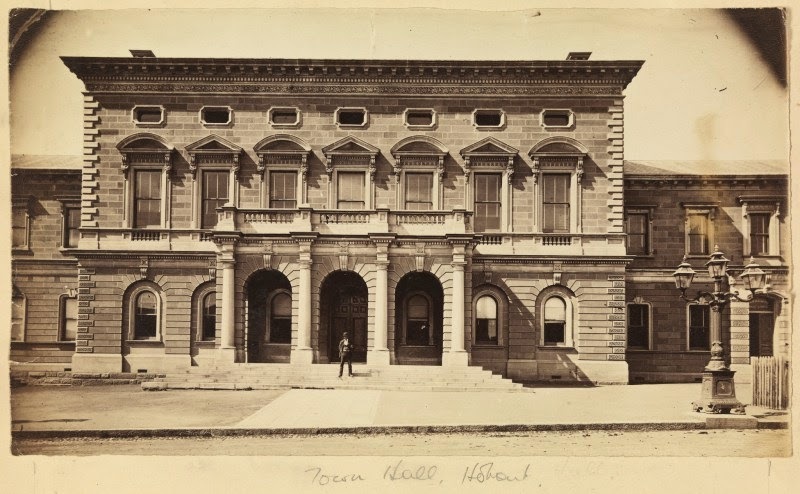 Life at the Hobart Town Hall as a full-time civil servant from January 1876, as Office-keeper by 1878, and Hall-keeper until December 1880 was both an interesting and stressful time for Thomas and Elizabeth Nevin. Their third child, second son Sydney John died there aged 4 months, reported in The Mercury on January 29th, 1877. Two more sons were born there; William John in 1878, and George Ernest in 1880. Other early accounts detail not only the Library, but other areas of the building which housed the Municipal Police Offices, a municipal court and a number of lock up cells in the basement. 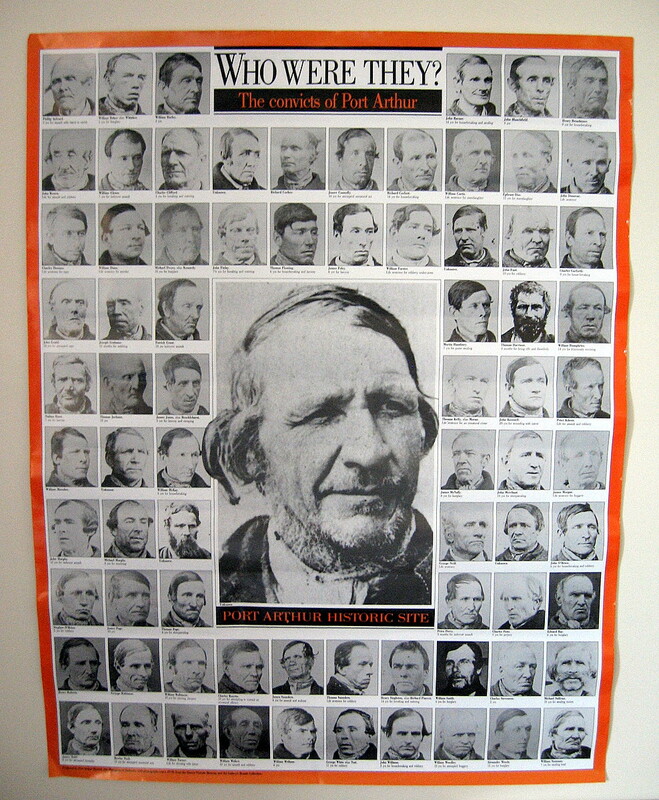 Thomas Nevin’s office duties included the provision of criminal identification photographs for the Police Office, taken of repeat offenders on incarceration and release from the Hobart Gaol, the Supreme Court, and the MPO for the central criminal registers. 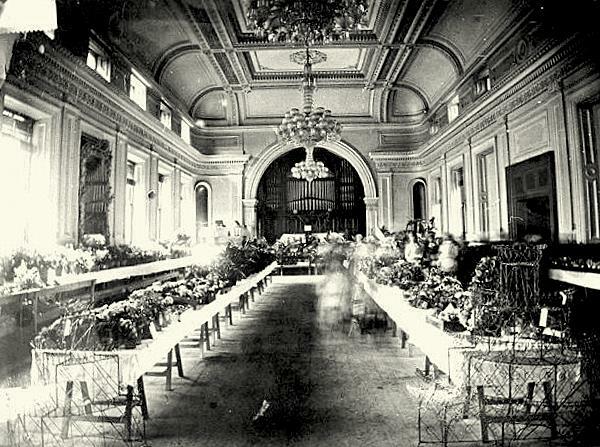 The Town Hall was the busiest venue in Hobart for a wide range of entertainments, including flower and poultry shows, art and music conversazione, bazaars of furniture, and packed-out evenings featuring dioramas of “Zulu” Thompson’s American, Zulu and Prussian wars. There are several accounts of the Chiniquy riots, depending on the teller. Some saw the events as a disturbance, others called them riots. Chiniquy’s account tells how the door of the Town Hall was broken down, and hand-to-hand combat ensued between the Protestant guard and the Catholic protesters, resulting in wounds on both sides. 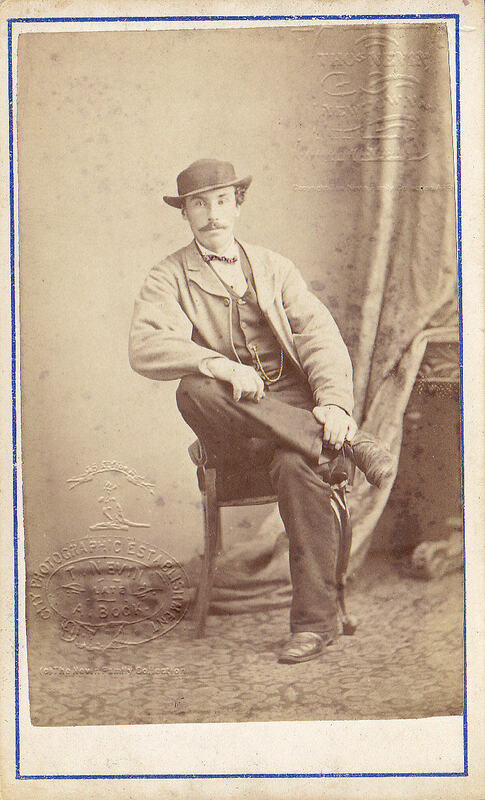 Thomas Nevin would have been armed with a constable’s baton as a Special Constable and issued a white armband. On the 24th of June, as I was delivering my first lecture in Hobart Town, the Roman Catholics, with the approbation of their bishop, broke the door of the hall, and rushed towards me, crying, “Kill him! kill him!” The mob was only a few feet from me, brandishing their daggers and pistols, when the Protestants threw themselves between them and me, and a furious hand-to-hand fight occurred, during which many wounds were received and given. The soldiers of the Pope were overpowered, but the governor had to put the city under martial law for four days, and call the whole militia to save my life from the assassins drilled by the priests. Believing that civic administration in Hobart needed improvement he offered himself as an alderman. 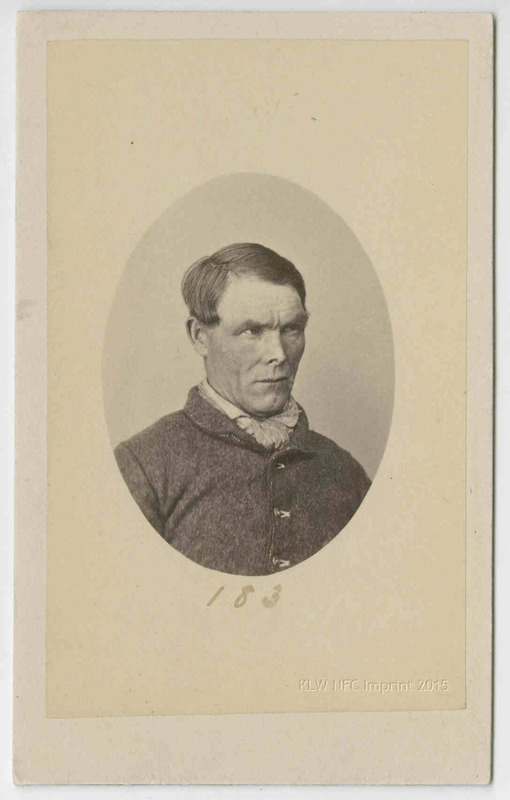 He was elected in 1876, was made a justice of the peace in 1878 and became mayor in 1879. 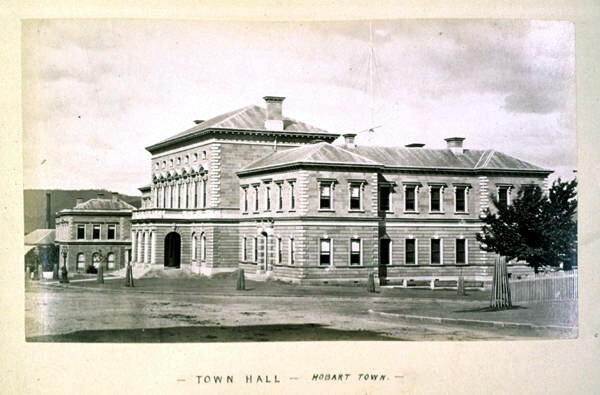 In that year Charles Pasqual Chiniquy, a priest expelled from the Roman Catholic church, caused great disturbance when he applied for the use of the Hobart Town Hall. The premier, W. L. Crowther, notified Burgess that he was responsible as mayor for the public peace. The City Council supported the right to liberty of speech and decided to enforce law and order with their own resources. Burgess recruited 150 volunteers to act as special constables, but when violence seemed imminent Governor Weld and his Executive Council decided to call out the volunteer corps. Two buglers were stationed at the Town Hall to give the alarm, but Bishop Murphy appealed to his flock and Chiniquy addressed a capacity audience without interruption. This was perhaps the most remarkable military episode in the otherwise peaceful history of Hobart. 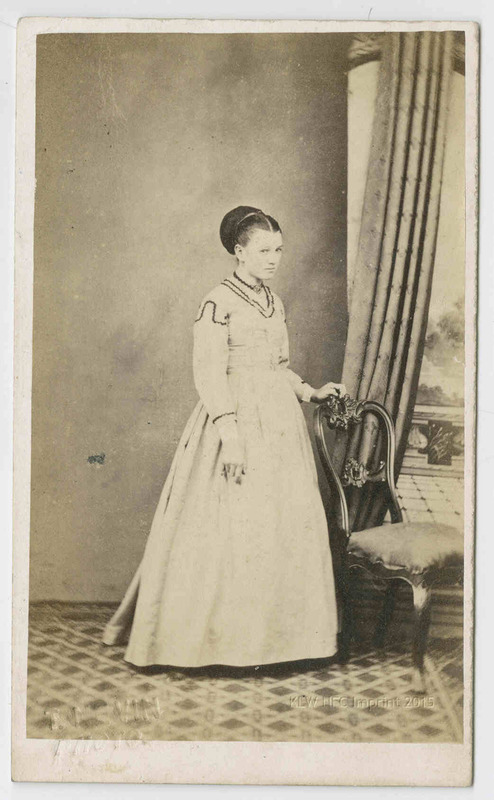 Reprint by Beattie, J. W. Date: 19–? 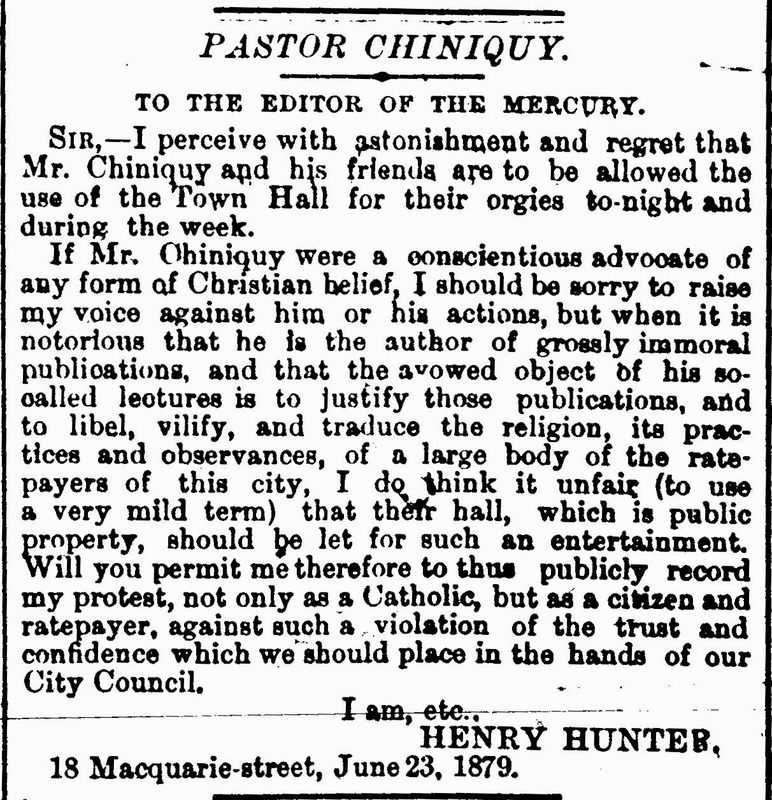 In July 1879 when the Canadian lapsed priest, Charles Chiniquy, lectured in Hobart, Catholic Archbishop Daniel Murphy (1815-1907) was praised by Governor Weld for preventing bloodshed. He persuaded a large gathering of armed Catholics in the Domain not to march to the Town Hall which was guarded by Orangemen; instead they escorted the bishop home. 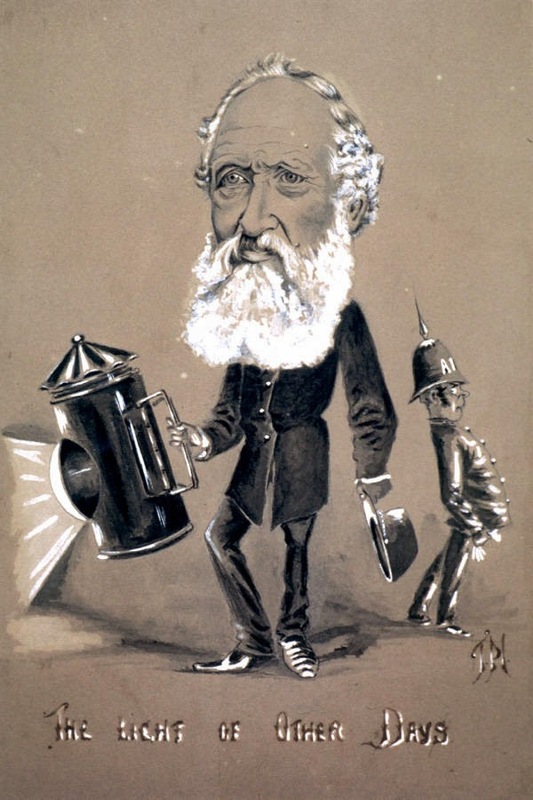 Like many others [Edward] Crowther (1843-1931) was alarmed by Russian infiltration towards India and he decided to reform the neglected Southern Tasmanian Volunteer Artillery. With carefully selected recruits and experienced officers he helped to make an efficient unit, despite official reluctance to provide powder and shell for gun practice; their discipline and appearance with field guns had a steadying effect when martial law was proclaimed in the Chiniquy riots. 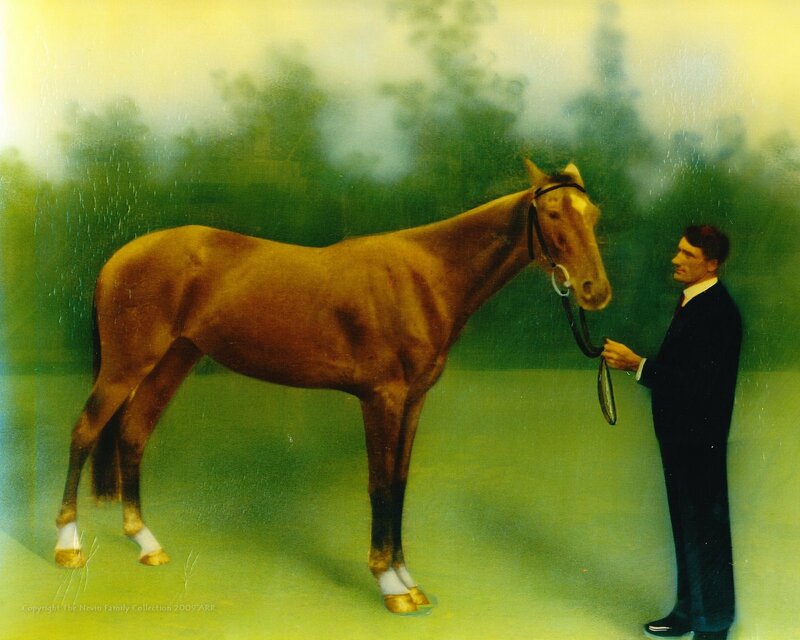 The late 19th century witnessed a remarkable decline in urban crime and disorder in Australia, England, and America. Historians have suggested various reasons for this decline including the spread of education, the introduction of social reforms, and greater economic prosperity. Another key factor was the development of more numerous and efficient police forces. As the importance of these factors differed from city to city, local studies of particular cities are needed to help understanding of the wider processes at work. 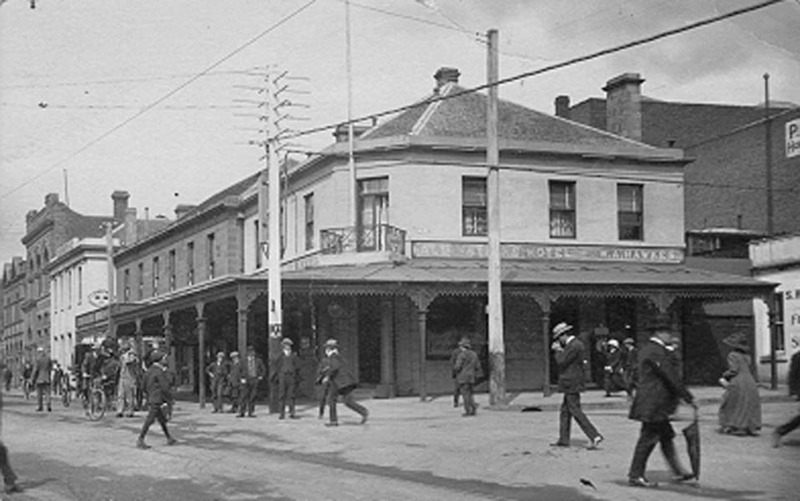 This article examines the role of the Hobart municipal police in helping to make Hobart into an orderly city. It considers the reform of the police after the Chiniquy riots of 1879, the role of Superintendent Frederick Pedder in enforcing a new code of conduct on the police and the improved working conditions enjoyed by the police. The article considers how successfully the municipal police dealt with disorder created by the Salvation Army, prostitutes, and pubs. The conclusion examines why centralisation of the police was introduced in 1898. 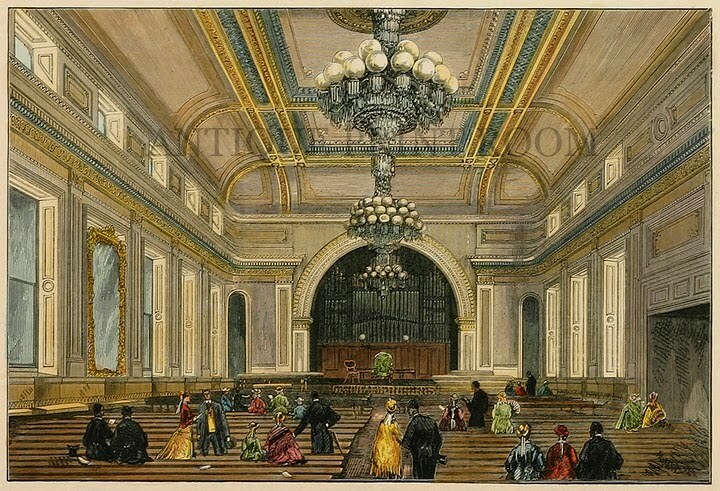 Hobart Town Hall interior 1879. 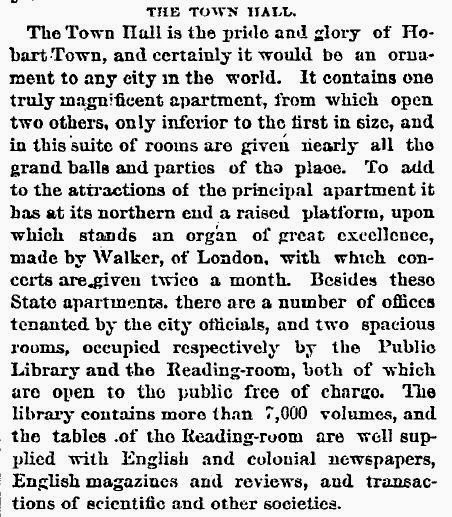 The Hobart newspaper the Mercury of June 26, 1879 was a special edition in many ways for photographer and Town Hall keeper Thomas Nevin. 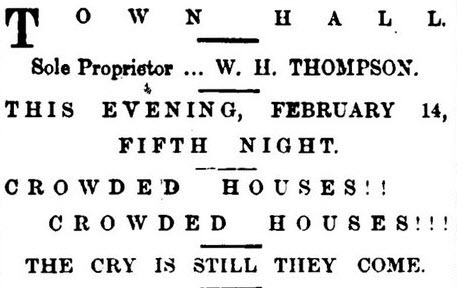 It contained a dramatic account of the riot at the Town Hall the previous evening, details of which may well have been supplied to the reporter by Nevin himself who was not mentioned as the Town Hall keeper probably because he was in the ante-room of the Town Hall keeping the source of the trouble, the Canadian renegade Catholic Pastor Chiniquy, hidden from view of riot leader O’Shea in the “Irish Corner” of the Hall. 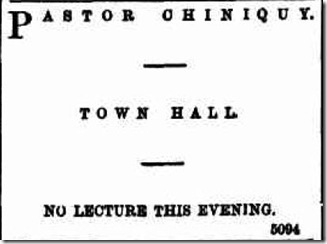 Chiniquy did not deliver his scheduled lecture that evening, nor the next. 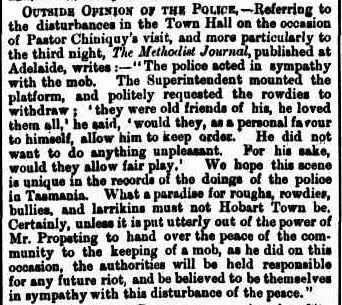 Thomas J. Nevin would have taken a very keen interest indeed in the proceedings at the City Police Court on July 10th, 1879 when criminal charges were dropped against eight men alleged to have rioted at the Hobart Town Hall while the Canadian renegade Catholic priest Pastor Chiniquy attempted to give a lecture. 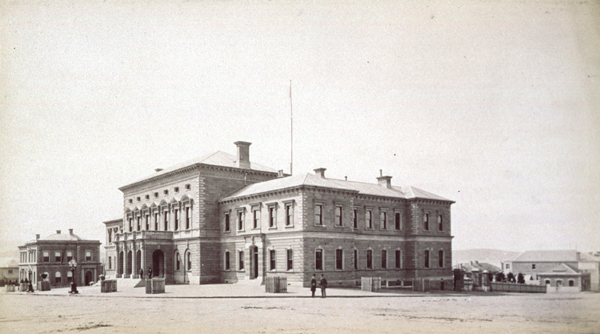 As the Keeper of the Hobart Town Hall appointed in December 1875, Thomas J. Nevin was responsible, among other duties, for the protection of the building itself. 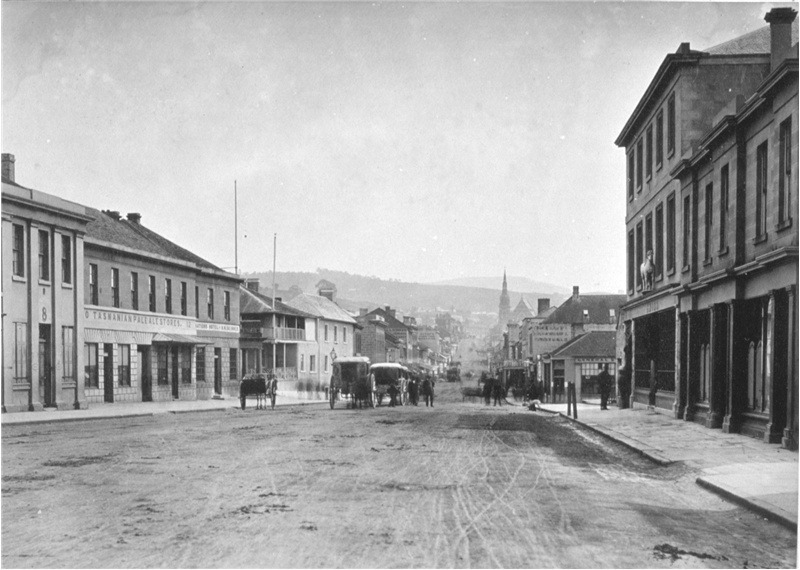 And for the duration of Chiniquy’s visit to Hobart, Nevin was also appointed a Special Constable, one of several assaulted during the riots. So his involvement with these proceedings against the rioters was not only in the interest of damages to the Town Hall buildings, it was damages to his own person and the threat to the safety of his family who were residents that he was keen to see vindicated. 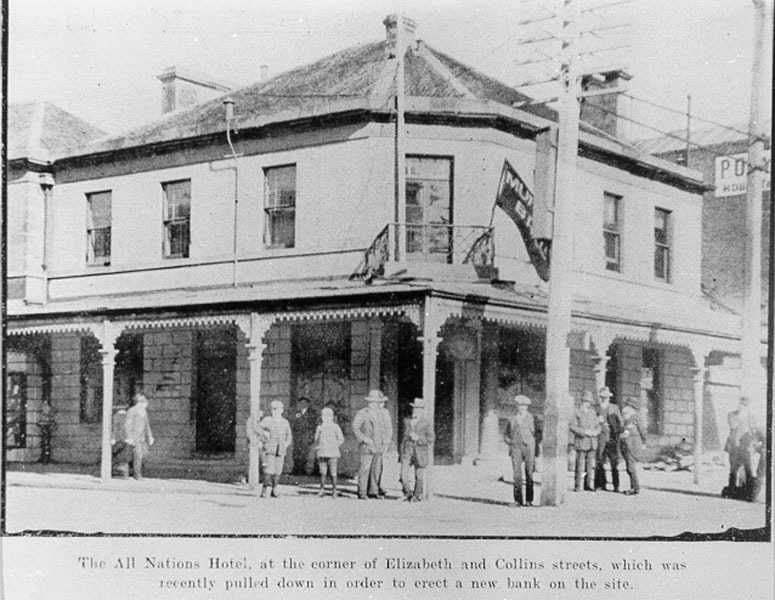 The eight rioters “were charged with riotously injuring a building“, “riotously injuring the Town Hall” and specifically – “the breaking open of the ante-room of the Town Hall” . The charges would have incurred a severe penal code punishment of seven years’ imprisonment and a trial at the Supreme Court. 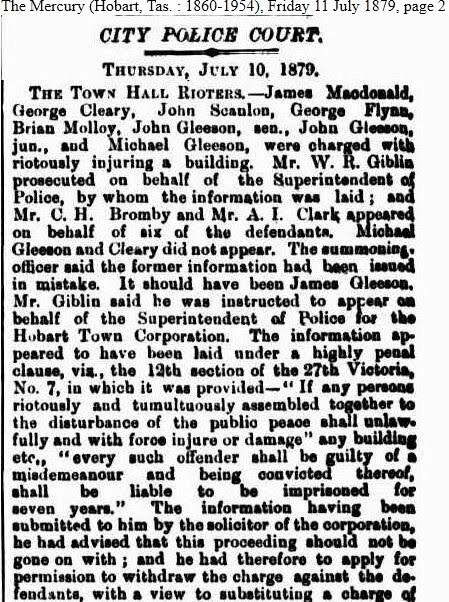 However, Attorney-General Giblin sought to substitute the charge with the lesser one of disturbing the peace, and at this sitting, reported in The Mercury on 11th July 1879, the charges were withdrawn entirely because of Giblin’s concern with excessive costs involved in such a trial. Mr. Giblin said he was instructed to appear on behalf of the Superintendent of Police for the Hobart Town Corporation. The information appeared to have been laid under a highly penal clause, vis., the 12th section of the 27th Victoria, No. 7, in which it was provided-” If any persons riotously and tumultuously assembled together to the disturbance of the public peace shall unlawfully and with force injure or damage” any building etc,, “every such offender shall he guilty of a misdemeanour and being convicted thereof, shall be liable to be imprisoned for seven years.” The information having been submitted to him by the solicitor of the corporation, he had advised that this proceeding should not be gone on with ; and he had therefore to apply for permission to withdraw tho charge against the defendants, with a view to substituting a charge of disturbing the peace and assaulting constables in the execution of their duty, a charge which could of course be summarily dealt with by the bench. The present charge, if proved to the satisfaction of the magistrates, would necessarily entail the committal of the defendants for trial at the Supreme Court ; but it was not desired to take that form of proceeding, hence he wished to withdraw the information. The information was not drawn under legal advice, but in a very natural ignorance of the difficulties which would surround a prosecution of that nature. 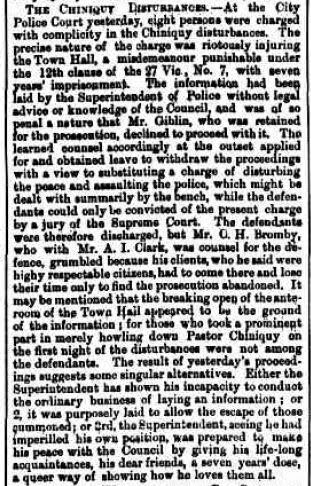 Mr. Bromby said he appeared with his learned friend (Mr. Clark) to answer a charge of riot brought against their clients – an offence they had never committed, and they were naturally anxious to be vindicated from having committed it all . But as the learned counsel for the prosecution asked leave to withdraw the charge, he could say no more. Mr. Tarleton: No charge being pressed, no defence can be heard. It is not for the Bench to put any obstacle in the way of the course that is proposed by the counsel for the municipality. I presume he has looked into the case in all its bearings and advised the course most expedient for the interests of justice, peace, and order, Therefore I shall not attempt to urge upon him to proceed with the case, but shall allow the information to be withdrawn, as he has desired. 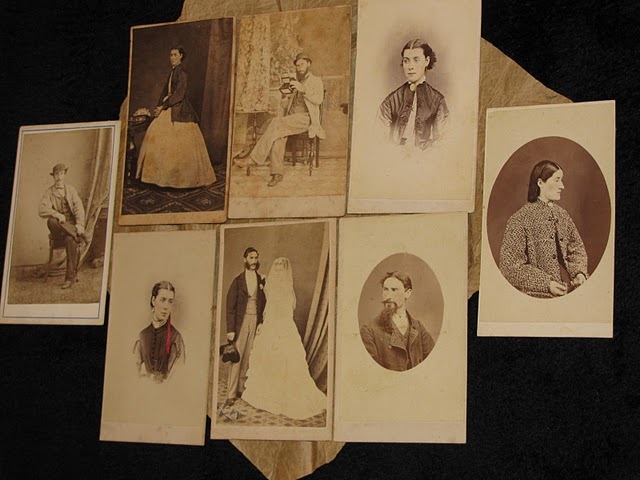 Mr. Bromby suggested that the defendants were entitled to costs. They were most respectable citizens, and they had been taken away from their occupations only to find when they got there that the prosecutor was obliged to withdraw from the charge. Mr. Tarleton: The bench has no power to order any costs. Let the defendants be discharged. The riots culminated in three key events: the withdrawal of charges against the rioters in July 1879 and Propsting’s somewhat sudden resignation from the police force a few months later. Thomas Nevin’s dismissal from the position of Keeper of the Town Hall followed soon after in late 1880 on a trumped-up charge of drunkenness while on duty surrounding “The Ghost” incident. 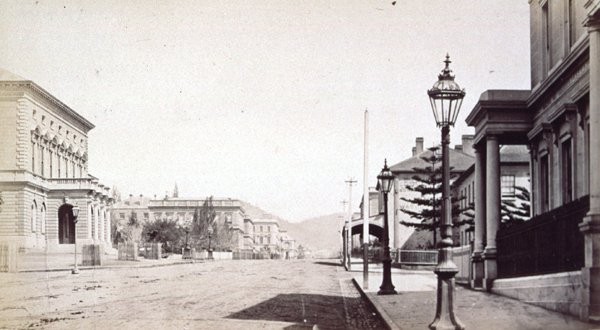 Other criticisms were levelled at Nevin, including one sneering article in The Mercury, 19th September 1879, which accused him of finding “too infra-dig” the job of watering the trees in front of Hobart Town Hall. 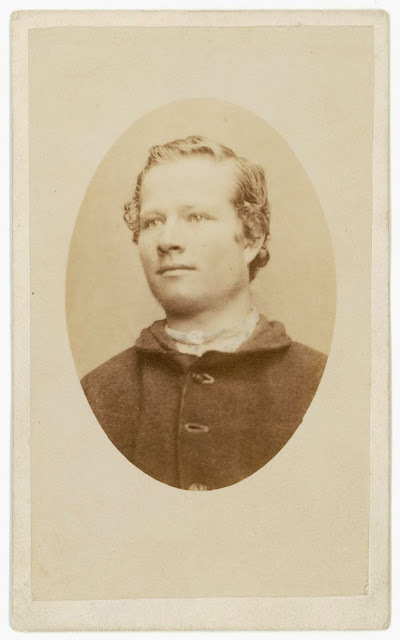 Although retained as police photographer and assistant bailiff by the City Corporation on compassionate consideration for his family after his dismissal from the position of Town Hall keeper, Nevin’s residual resentment at the law’s laxity in pursuing the Chiniquy rioters led him to test the legislation pertaining to the rights of assembly, congregation and disturbing the peace on 28th February 1881 when he and two other men stood on the footpath outside the All Nations Hotel at the corner of Elizabeth and Collins Streets, Hobart. Although reported by the police and requested to make a court appearance, the charges again were dropped by Tarleton at the Bench. 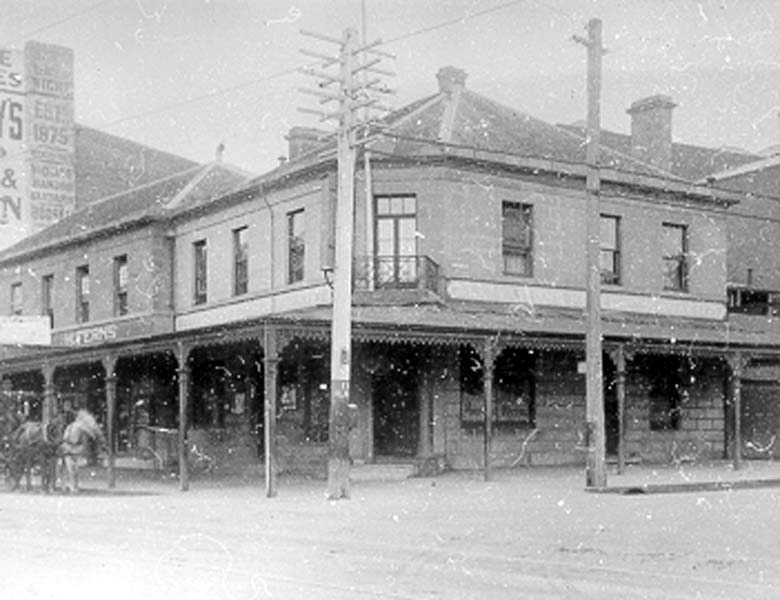 OBSTRUCTING THE THOROUGHFARE – Thomas Nevin, Thomas Paul and Thomas Hodgson were charged with having on the 28th of last month stood on one of the footways of a public street within the city, so as to prevent the free passage of others, and refused to pass on when ordered to do so by a constable. Plea: not guilty. Mr. SARGENT for the defence. 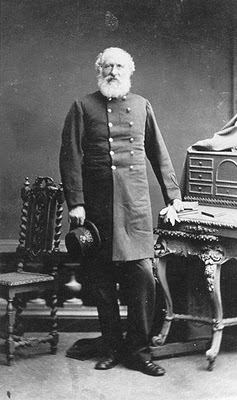 Constable Beard deposed to the three defendants having [illegible] … standing at the corner of Elizabeth and Collins Streets and causing other passers-by to go into the gutter. He asked the defendants to move on one side, when they said they were going away in a minute. When he returned in five minutes’ time, Paul said, “Look out, here comes Beard again”. Hodgson replied, “It don’t matter; we’re talking on business.” he again asked them to move on, but they declined to do so, and ten minutes afterwards, when he again returned, he found them in the same place. Paul then wanted to know why he was disturbing them so much and could not go and look after other people; and Hodgson asked if he wanted to put them out in the road. Nevin said, “We’ll not move till we’re forced”, and took a piece of chalk out of his waistcoat pocket, and marked with it on the footpath. He then stood on the mark and said he would continue to do so until he was taken into custody. Nevin then waved his hand to witness and told him to “move on”. 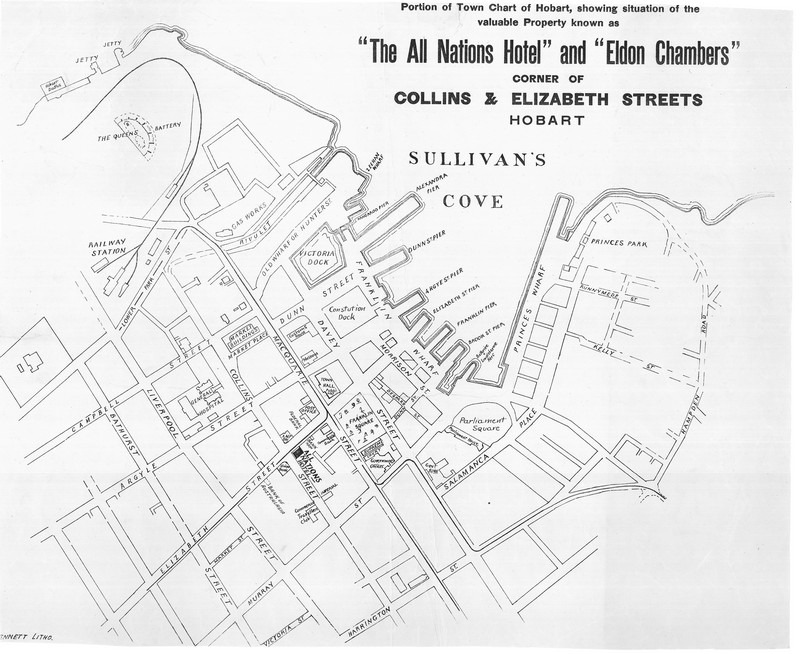 TO Mr. SARGENT: The defendants were standing outside the All Nations Hotel. When he spoke to them the third time they moved about a foot from the kerbing. Could not say the width of the footpath. He ordered them all to move on. There was a good deal of traffic on this evening. Nevin was setting the police at defiance by his action. To the Bench: Mr. Hodgson is a contractor on the wharf, and the other two are in his employment. He did not listen to their conversation, or know what it was about. 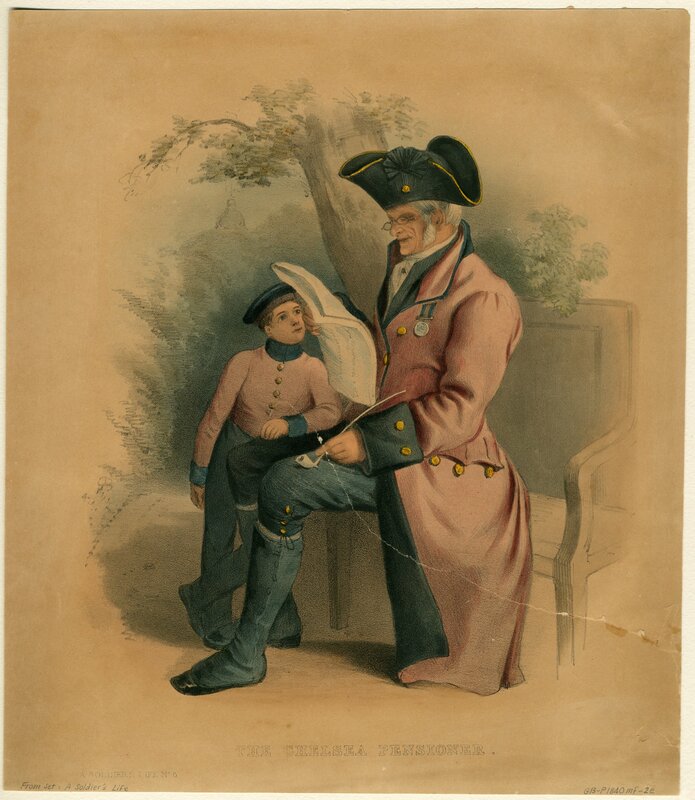 Mr. TARLETON said that the Bench did not think it necessary to ask for any defence, as the by-law under which the charge was enacted, as its preamble explained, for the preventing of the congregation of idle and disorderly persons in the streets and public places, and was certainly never meant to prevent two or three respectable citizens talking over social matters or business affairs, as in this case. It would be a monstrous strain of the by-law to consider this a breach of it, and the information was therefore dismissed. These and other by-laws were to become the testing ground as the Labor and Union Movement gathered strength through the 1890s Depression. 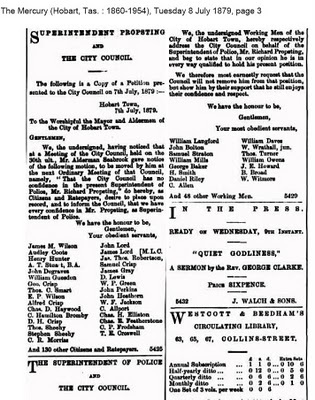 “We, the Working Men of the City of Hobart Town” were how the supporters of Propsting identified themselves in The Mercury on 8th July 1879. Notes: View taken from the corner of Macquarie and Argyle Streets.